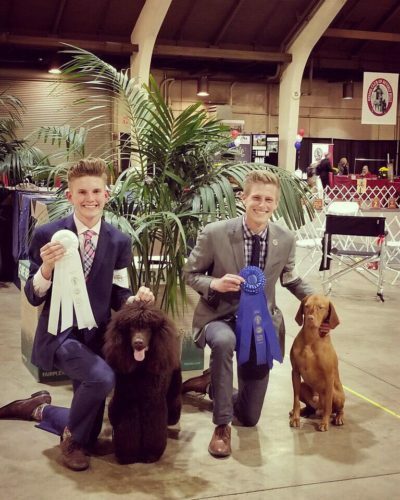 Feb18: Remy wins the Sporting Group at Sun Maid KC in Fresno! 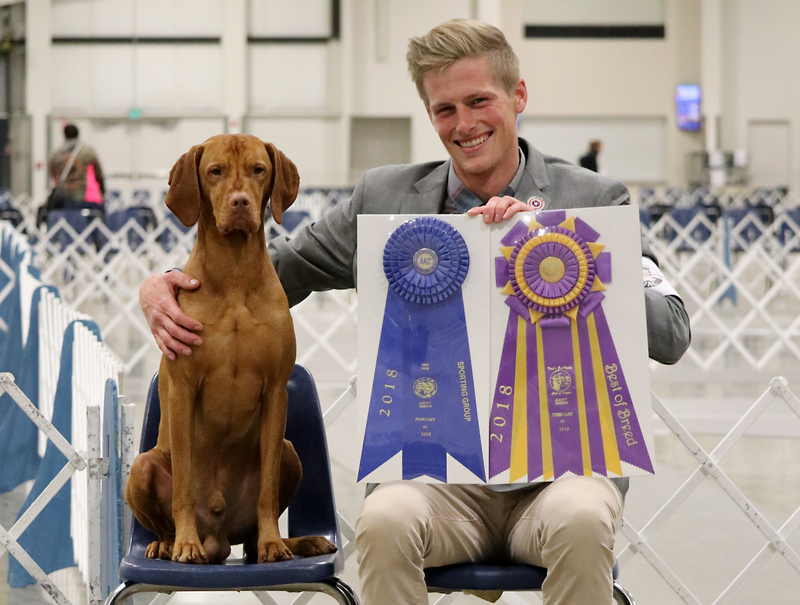 Feb18: Remy wins the Sporting Group x2 and goes BIS at the Santa Clara Valley KC in San Jose!! Feb18: Remy goes BOB x3, BISS, Sporting G2x1 and Sporting G1x2 at the Covered Bridge Cluster in Albany, OR! 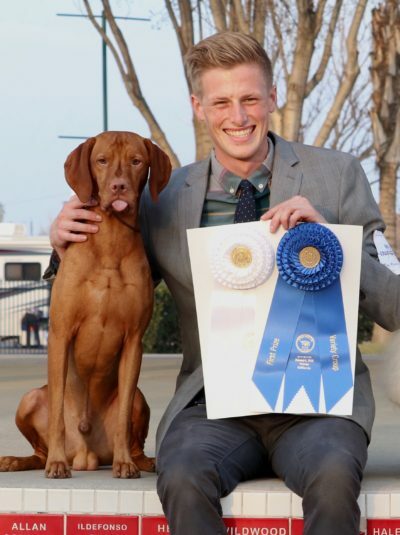 Mar18: Remy wins the Sporting Group at KC of Beverly Hills! 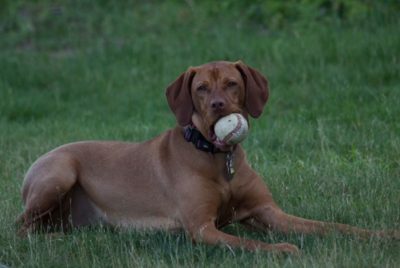 In the 1970s, Vizsla lines were markedly distinct: there were field Vizslas and then there were show Vizslas. We wanted Vizslas who were truly dual dogs: able to hunt one day and show the next; who could be affectionate companions of sound temperament and health with exemplary trainability. 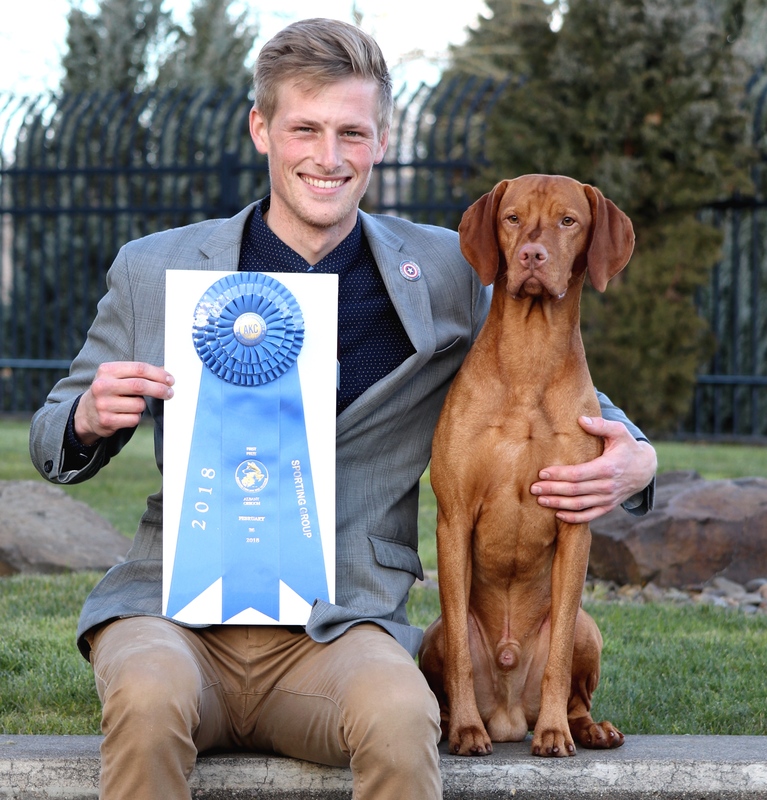 In 1977 we purchased the first Golden Empire Vizsla out of the Piroskas line: “Nitro,” Piroskas Golden Empire CD. Shortly thereafter we purchased “Sabrina,” Golden Empire’s Sabrina CD from Barbara Stephenson of Rotkopf Vizslas. 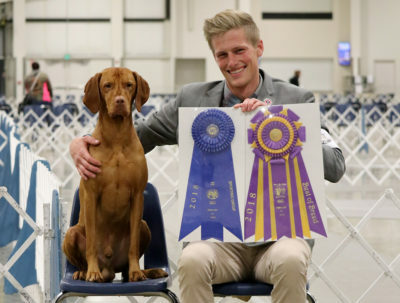 Barbara’s breeding program was very inspirational and influential on Golden Empire; she had beautiful dual dogs who were just as successful in the show ring as in the field. For several years we have painstakingly developed and curated our breeding program with tireless dedication and commitment. 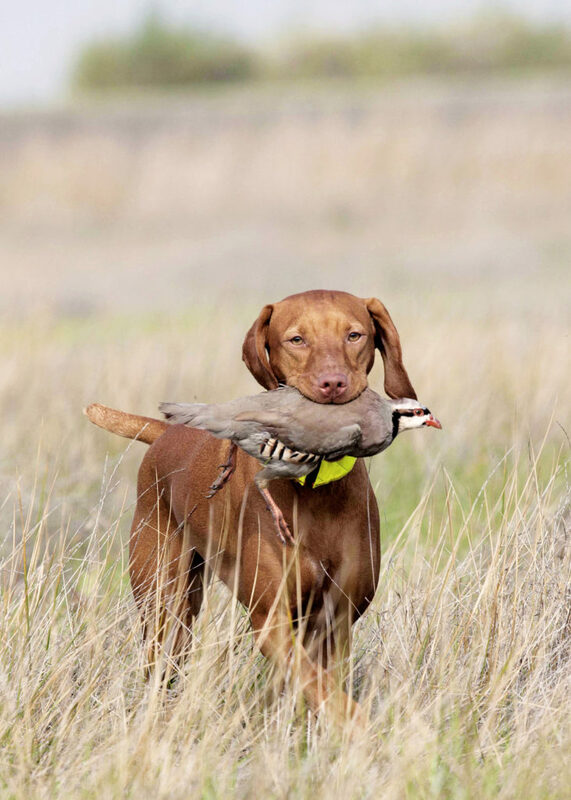 We are proud to say our breeding program has been successful and we have produced: 34 Conformation Champions, 5 Field Champions, 15 AKC Hunting titles and 3 Dual Champions. The Golden Empire lines have had a significant influence on the merging of field and show lines – Super Charger alone has 91 offspring to date. We have spent over 39 years committed to refining our breeding program, promoting responsible breeding and stewardship of the breed. We have a very selective and limited breeding program, aiming for distinction and quality over quantity. 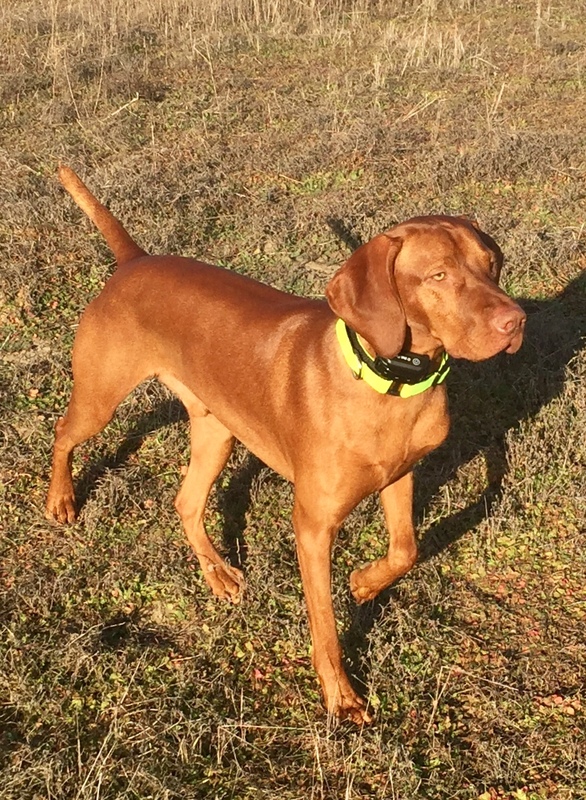 We take the time to thoroughly research and plan the breeding match several months before even attempting a breeding, to ensure alignment with our breeding goals and practices. We strive for sound temperament, drive in the field, excellence in the show ring and outstanding trainability and versatility. 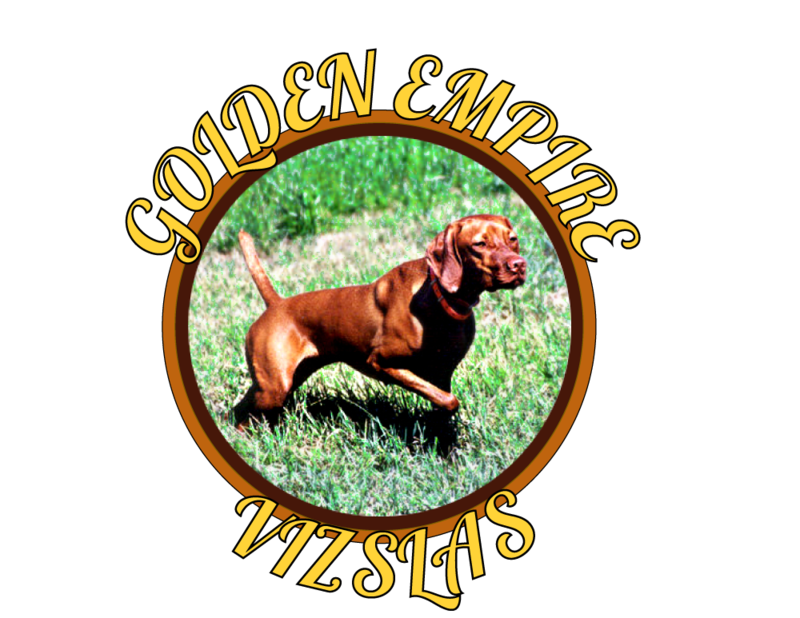 The latest news from Golden Empire Vizslas! What a spectacular weekend for Golden Empire! 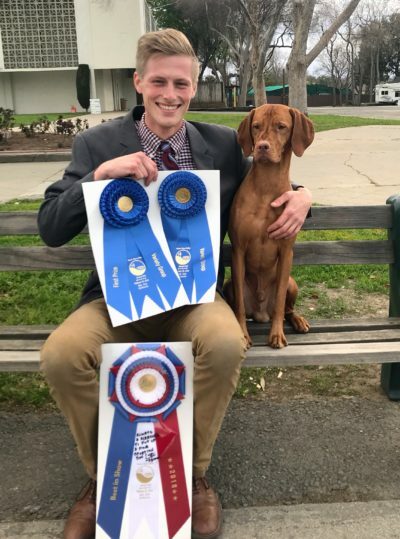 Saturday: BOB and Sporting Group 1 Sunday: BOB and Sporting Group 2 Huge, HUGE congratulations to the team for their successes this past weekend! Tune in to the USA Network on 01Apr18 @ 6PM PST to watch the televised recording of his sporting group win! Huge HUGE congratulations to Remy and Conor on their AMAZING weekend in Oregon, with very tough competition! Friday: BOB and Sporting Group 2 Saturday: BOB, Sporting Group 1 and BISS #3 for Remy! Monday: BOB and Sporting Group 1! What an incredible weekend! We are so elated and thrilled. Congratulations! BIS Santa Clara Valley KC, San Jose CA, 17-18Feb! We are always SO pleased to receive updates from our puppy owners. We recently got this great photo of a Trace x Remmy puppy. He loves to hunt!